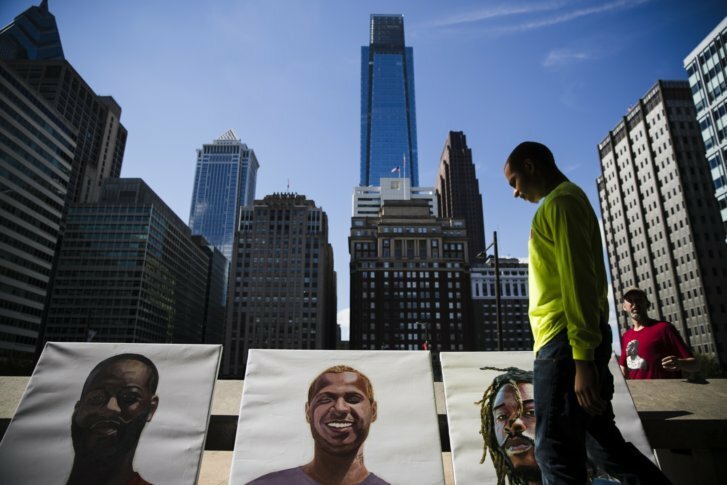 A temporary art installation highlighting formerly incarcerated men and women who are working to transform their lives — intended to spark a conversation about mass incarceration — hovers over the Rizzo statue in Philadelphia. PHILADELPHIA (AP) — For nearly two decades, Philadelphia’s Municipal Services Building has been home to a bronze sculpture of Frank Rizzo, the polarizing, tough-on-crime former mayor and police commissioner. Now, a temporary art installation highlighting formerly incarcerated men and women who are working to transform their lives — intended to spark a conversation about mass incarceration — hovers over the Rizzo statue. The artists involved say that’s no accident. For the 17 men and women depicted in oversized portraits, rehabilitation has come through connecting with art and their community. They all work for a Mural Arts program called “The Guild,” a paid apprenticeship for formerly incarcerated people, seen as a way to unite those affected by crime through shared creative expression. Their images — many looking elated and beaming, others evoking a quiet pride — wrap around the base of the building and are painted against a brick background meant to symbolize the barriers to re-entering society after being released from jail. During five performances over the next few weeks, the public will have an opportunity to wipe away a brick, and replace it with their own handwritten thoughts on how to solve problems in the criminal justice system. By the end of the program, the bricks will have vanished, replaced with solutions. The interdisciplinary program opens Friday with a performance by poet Reginald Dwayne Betts, a convicted felon who’s now a celebrated poet and memoir writer, has earned a 2010 NAACP Image Award, and is married with two children. He is currently working on a doctorate in law at Yale University and has a clerkship with a federal judge. Other formerly incarcerated artists to perform are: Shontina Vernon on Oct. 11; Sue Ellen Allen on Oct. 18; and Mary Enoch Elizabeth Baxter on Oct. 25. The program culminates on Nov. 2 with a symposium at the University of Pennsylvania led by Luis Suave Gonzales. The program is one of the first projects funded by the Art for Justice Fund, which was launched in 2017 and invests in programs working to cut the U.S. prison population and boost education and employment opportunities for the recently released. Philanthropist Agnes Gund in collaboration with the Ford Foundation and Rockefeller Philanthropy Advisors founded the fund. Christopher Bryant’s face is one of the 17 featured on the mural. The 24-year-old did 2 ½ years in prison for robbery, and has been working with The Guild for about three months, referred by his probation officer. He’s learning carpentry, airbrushing and life skills and has worked on murals around the city, he said. “It’s exciting and I’m so happy my face is a part of something positive. I want people to know I’ve changed,” he said.